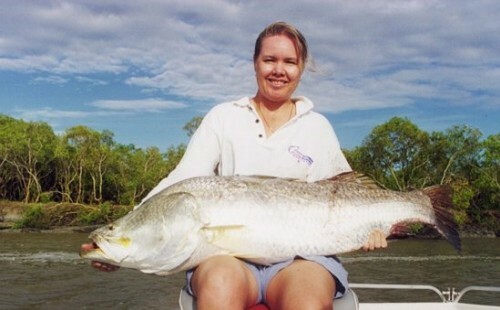 This one day Barra trip offers clients the unique opportunity to discover & fish the magnificent billabongs and waterways of Darwin and the Northern Territory in pursuit of the legendary Barramundi. Fishing charters operate all year round, with the exception being during the monsoon rains, which occur between late December and the end of February. Darren has extensive knowledge of the Northern Territory’s waterways and with his expertise, we are able to provide professional guidance for the beginner to the experienced angler. Our fishing charter destinations vary from awesome wetlands to magnificent billabongs. Prepare to be struck as you will witness the Territory’s superb flora and fauna. Experience some of the most unbelievable light game fishing in one of the most spectacular locations imaginable. Fishing for barramundi, giant GTs, spanish mackarel, golden snapper, coral trout, queen fish, tuna, mud crabs and more. Tackle – All top quality equipment is provided to our clients. 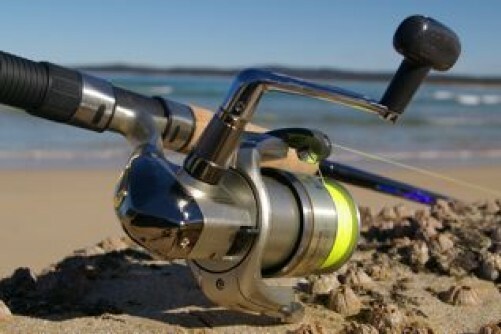 We use 6-8kg Shimano Rods, complimented with Shimano Reels Curado 200, Finn 30lb braid and Reidys lures. Boat – Indulge yourself by fishing in comfort in our very stable, very spacious, 7.2 metre custom built barra boat. A locally made boat called an Aquarat from GS Marine. This boat is powered by a 250hp 4 stroke Suzuki and has a 300 litre fuel tank for those big trips. It is fitted out with Lowrance Sounders and GPS, comfortable swivel seats (eight different seating positions to satisfy your thirst for ultimate comfort) and a canopy. Our boat also features a large casting deck for the Fly Fisherman. For your utmost safety and peace of mind on the water, our boat is built to Northern Territory Marine Survey Requirements. Regularly checked safety equipment, maintained first aid kit and satellite phone is present in the case of any emergencies. Please note that there is a maximum limit of four persons per boat for barramundi charters. Larger parties can be arranged with notice, simply notify us of the number of anglers when booking. Vehicle – We transfer our clients to their chosen destination in the comfort of an air conditioned, 7 seater, 4.2 Turbo diesel Nissan Patrol. Our vehicle is registered as a Tourist Vehicle, this means it is subjected to Northern Territory Government standards which features regularly checked safety equipment and maintained first aid kit. Departure Point: From your Darwin/Palmerston accomodation. Darrens Northern Territory Barra Safaris is a quality tourism product that offers clients the unique opportunity to discover the magnificent billabongs and waterways of the Northern Territory in pursuit of the legendary barramundi. Fishing charters essentially operate all year round, with the exception being during the monsoonal rains, which occur between late December to the end of February. 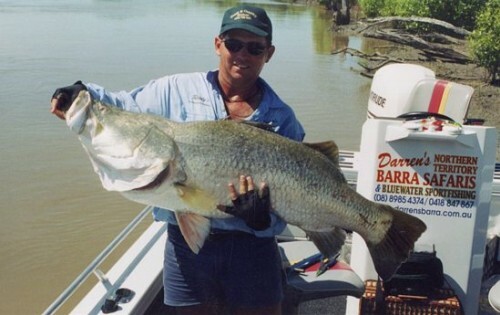 Barramundi are caught all throughout the year in the Top End. The more “explosive fishing generally occurs due to the wet season and the monsoonal rains. Record fish frequently being landed in the “Run Off” which usually starts in February and goes until early June. I recommend that clients book early for these periods, especially for the “run off” which has established a worldwide reputation for excellent barramundi fishing. To take full advantage of the tremendous fishing during these times, extended trips are also highly recommended. The Top End also offers great fishing in the “Dry Season” which starts around June and finishes late October. Due to this time of year we are usually fishing in mainland billabongs and estuaries, which not only offer excellent fishing but unforgettable picturesque fauna and flora. Reef fishing is also available all year round pending on tides. Where we will be targeting extra large Black Jew fish, Golden Snapper plus various other reef species. We have a 7 metre customised Barra boat built to Northern Territory Marine Survey requirements with full safety equipment. This enables us to take 4 clients Barra Fishing and 6 clients Bluewater Fishing plus guide giving you maximum comfort and utmost safety. 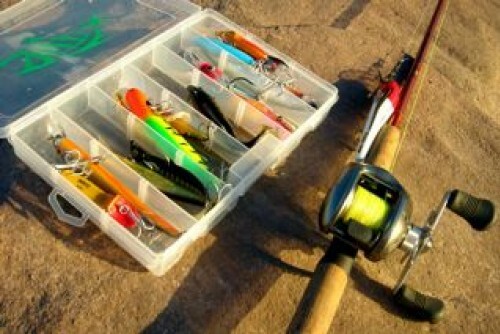 All fishing gear is provided (except for fly fishing) and clients are welcome to bring their own. I guarantee a personalised safari that caters for fishing enthusiasts with all levels of experience. I have an extensive knowledge of the Northern Territorys waterways and with expertise to provide professional guidance for the beginner to the experienced angler.